Investing In Silver Can Be A Wild Ride At Times. Thinking of investing in silver? Then you need to understand that this precious metal is more notorious for its volatility than gold. The reason being that silver has lower market liquidity, and because many of its uses (around 40%) are industrial and commercial. This means it is more at the mercy of speculators and large traders (like Exchange Traded Funds, traders of futures contracts and derivatives), as well as uncertainty of supply, economic downturns and recessions, or mine closures due to political events or natural disasters. "These are highly speculative investments. Most investors would recognize it's purely gambling... It's not to say that gold is without risk either (but investors should) tread very carefully (with metals) because commodity prices are very, very volatile on the upside as well as the downside." For those considering investing in silver here are a few charts that will give some idea of what kind of volatility is possible. 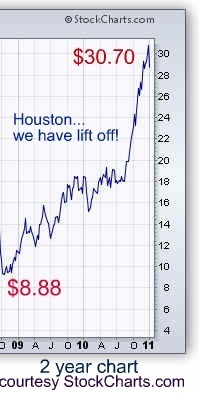 In a two year period from October 2008 to December 2010 the silver price skyrocketed from $8.88 to $30.70... a whopping 248 percent! Some analysts think the Global Financial Crisis (which began in 2007 and hit many real estate and stock markets around the globe hard) spooked investors, starting a "flight to safety" which saw them investing in silver, gold, bonds and cash. But what does the picture look like if go back 10 years? Now this is where we really see volatility. 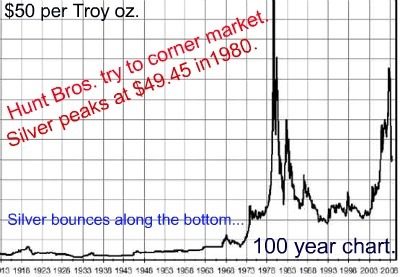 That huge spike up to almost $50 dollars in 1980 happened because of a massive attempt to manipulate the silver market. From 1973 brothers Nelson and William Hunt set out to corner the market in silver. By the end of 1979 they had almost succeeded and controlled an estimated 100 million ounces. The Federal Reserve and New York Mercantile Exchange finally stepped in and stopped this attempt at market manipulation by changing the trading rules. Two months later silver prices had crashed below $11.00 an ounce. Many investors were wiped out. Nelson Bunker Hunt filed for bankruptcy in 1988. That's why the analyst quoted above classified investing in silver as one of those "highly speculative investments...it's purely gambling". 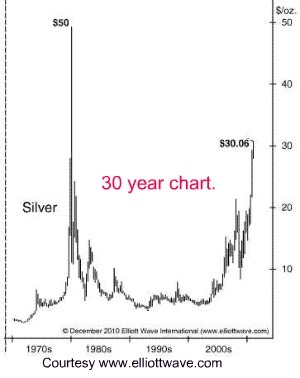 And that's why investing in silver may not be a "buy and hold" proposition but more suited to the philosophy "There are Times to Buy and Times To Sell". Investing In Silver... Ways To Start. Silver bullion bars range from 1 oz up to 1000 oz (68 pounds) and are usually .999 fine (99.9% pure). The metal's bulk and weight means it is sometimes much easier to purchase it from and store with a recognized commercial custodian like Australia's Perth Mint or bonded warehouse (which will involve charges). Make sure your holding is allocated (meaning you are allocated your own stamped and numbered bars) which become solely your property. Unallocated silver is not your property; your holdings are pooled with other investors and remain the provider's liability which "promises" it can supply the metal. Pre 1965 junk coins usually contain around 90% silver (later coins had as little as 40%) and can be purchased for smaller amounts, but are weighty and bulky. Minted fine coins and rounds (the latter resemble a coin but are not legal tender) are 99.9% pure and greatly sought after by investors in times of financial stress. Investing in silver coins or bullion appeals to many investors who don't have large sums of available cash. When investing in silver bullion or coins a bank safety deposit box may be a wise consideration. If you do decide to install a discrete, secure safe in your home, total discretion must be maintained with friends, family and acquaintances to minimize the risk of burglary or robbery. ETFs can provide exposure to the silver price through either futures contracts and derivatives, physical silver held in ETFs, or both and allow a leveraged bet on silver's price. The recent explosion in ETFs has been criticized by some analysts for causing or exacerbating metal shortages and price spikes. The largest silver ETF gained 72% in 2010 to control silver worth $9 billion dollars. Owning shares is riskier than owning bullion or coins, but can produce greater returns. 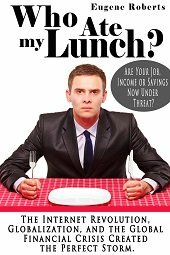 The performance of shares can be influenced by management decisions, political upheaval, natural disasters (e.g. flood) as well as the vagaries of the stock market. Silver is usually mined along with other metals (like zinc, copper, lead or tin) which also can affect profitability. Junior explorers carry greater risk still, their price not necessarily correlating to the price of silver. These financial instruments are for experienced players only. 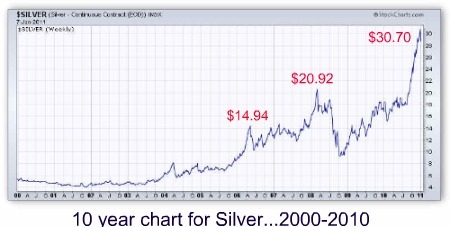 Crystal Ball Gazing...Silver During Inflation or Deflation. The price of both gold and silver has surged over recent years spurred on by investors battered by the Global Financial Crisis in a "flight to safety". As governments flood the globe with liquidity (Quantitative Easing or "easy money") in an effort to reinflate and resuscitate crushed property and share markets, fears of run away inflation or even hyper-inflation are emerging. The Inflationists are certain the prices of gold and silver ("the only true money" as opposed to "fiat" or "phony" paper money) will sky-rocket. Their predictions range from $50 to $65 for silver by 2012 and $1,700 for gold. Several are even counting on silver returning to its historical value of 1/16th the value of gold and hoping for closer to $100. If they are correct, then soaring inflation may very well turn "cash into trash" in which case the price of the precious metals may continue to soar as desperate investors scramble to get on board. Some "silver bugs" would assure us that silver is also a safe haven during a Deflationary Crisis arguing the price of silver will hold up, but reckon even if it doesn't, that silver will drop less than other asset classes. 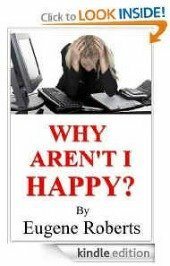 Sceptical Contrarians, however, aren't convinced. Their Contrarian view is that silver is likely to crash (as it has in the past) if the world experiences a double dip back into a deflationary recession and commodity speculators all try to rush for the exits at the same time. Their prediction is for a strengthening of the U.S. dollar as debtors scramble to raise cash and pay back debt ... when "Cash will be king." As they say... "Watch this space."